Please choose the products you would like to add to your account below. Zapp! English Whole System Super Pack (EN) - Immediate Download €39.00 The 'Whole System' Super Pack brings you EVERY Zapp! English product we have ever made (Level 2 + Level 3), and more, at the best price. Get our complete Zapp! English audio & eBook collection, including full transcripts, essential vocabulary and extra practice materials for every one of the 180 Zapp! English episodes. This pack includes more than 60 hours of audio classes + 180 eBooks!! Plus NINE FREE Bonuses! Zapp! 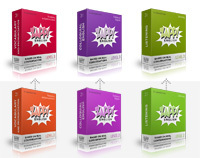 English Level 3 Super Pack (EN) €29.00 This "Super Pack" contains every Zapp! English Upper-Intermediate / Advanced (Level 3) eBook and audio class we have ever made, and more, at a huge saving. This pack includes 30 hours of Audio Classes and 96 eBooks!! Plus THREE FREE bonuses. With this pack, we guarantee you'll make huge progress with your English; understanding more, speaking more fluently and feeling more confident. Stripe has the strictest level of PCI security. Copyright © 2019 Zapp! English || All rights reserved.